Man, I want so badly to like this thing, given that it seems to be my mission in life to embrace the Weird. 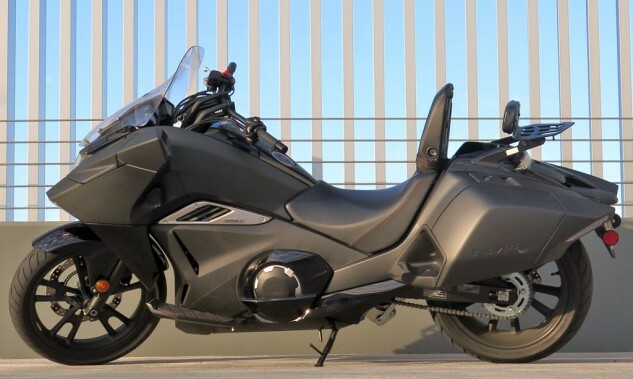 But this Honda isn’t even all that weird, not when you compare it to blue-sky shots like the old Pacific Coast (which has achieved cult status) or the outlandish Rune, or even the Fury chopper – which is a thing I never thought I’d see Honda build. Then again, it’s pretty out there: No bike I’ve ridden before lights up the wild-eyed street people of the OC quite like this one. The NM4 is pure stealth fighter/ Batman meets Capt. Nemo, but it’s not a radical departure from the DN-01 flop, and it’s not too stylistically removed from the hugely popular (in Japan anyway) Helix scooter. 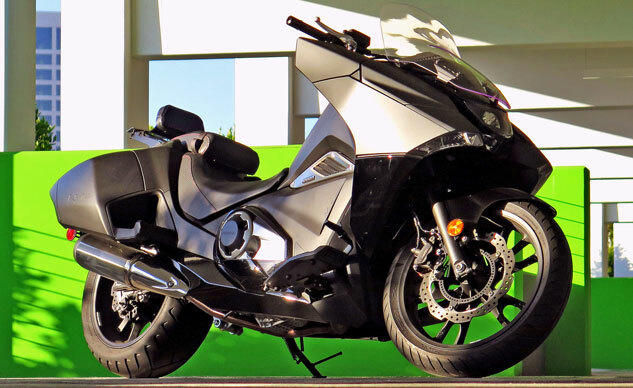 What it does have going for it that neither of those do is the excellent engine and Dual Clutch Transmission from one of my current favorite motorcycles – Honda’s NC700X (and the not-so-favorite CTX700). The thrusty, undersquare 670cc parallel-Twin lies low and forward, canting its cylinders at a 62-degree angle in the steel-tube frame, making for a low motorcycle and a long one, with a wheelbase of 64.7 inches. The NM4’s long wheelbase is about 4 inches more than its NC and CTX stablemates, which helps the seat be just 25.6 in. from the deck. In fact, it’s all about long and low: The seat’s low enough to make you feel like Batman riding a recumbent bicycle, even a couple inches lower than the CTX700’s, but the NM4’s floorboards don’t make your legs have to stretch so far forward as the CTX’s. Another nice touch is a passenger seat that flips up to serve as a three-position ratcheting adjustable backrest – a really nice thing to have when you ratchet up the speed on a recumbent bike like this one. For a thing that generally feels like an overgrown scooter around town, the NM is also quite happy to go as fast as you dare. Air pours reasonably cleanly over the Adams-apple-height windscreen, depending on wind direction and speed, and the front machine-gun mounts/ mirror pods direct air around your hands. Along with the standard heated grips, the NM4 might not be a bad bike to find yourself upon in cold weather. When it’s hot, though, which it was when we had the bike, the bodywork also does good work keeping engine heat at bay. 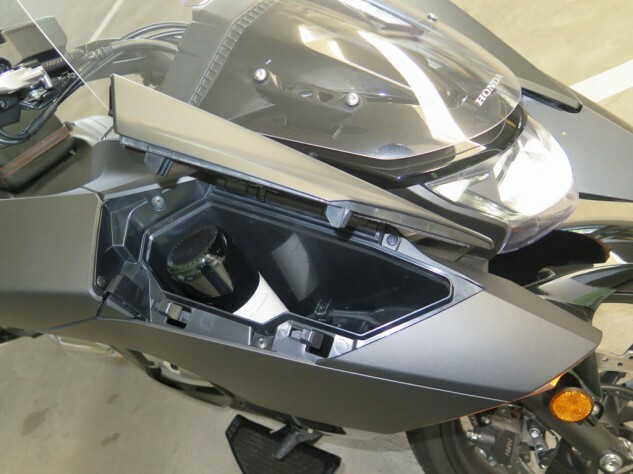 The passenger seat/ backrest is a nice touch; the passenger backrest/ rack is optional equipment. LED lighting adds to your Batman cred. Drive-chain oiling fetishists may have difficulty with the NM4. 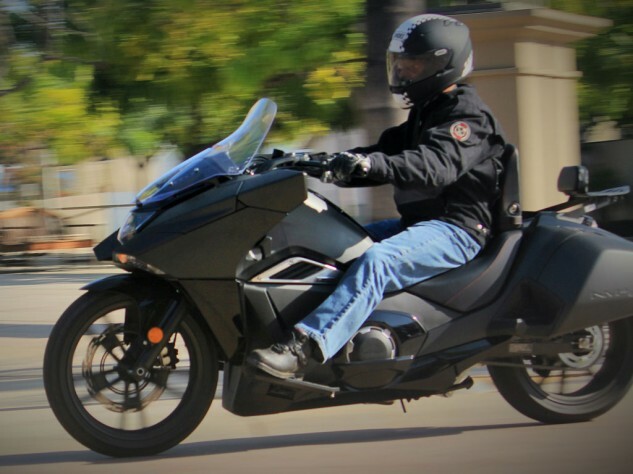 Some motorcyclists have a hard time adjusting to the low-revving nature of Honda’s 670 Twin; the auto-clutch gearbox basically eliminates their problem of being unable to not bang into the rev limiter. Leave it in D (Drive) and the NM pussyfoots quietly about. Thumb it into S (Sport) and give the throttle a big twist, and the gearbox shifts at higher rpm, downshifts more aggressively, and has the bike taking on a whole new personality. 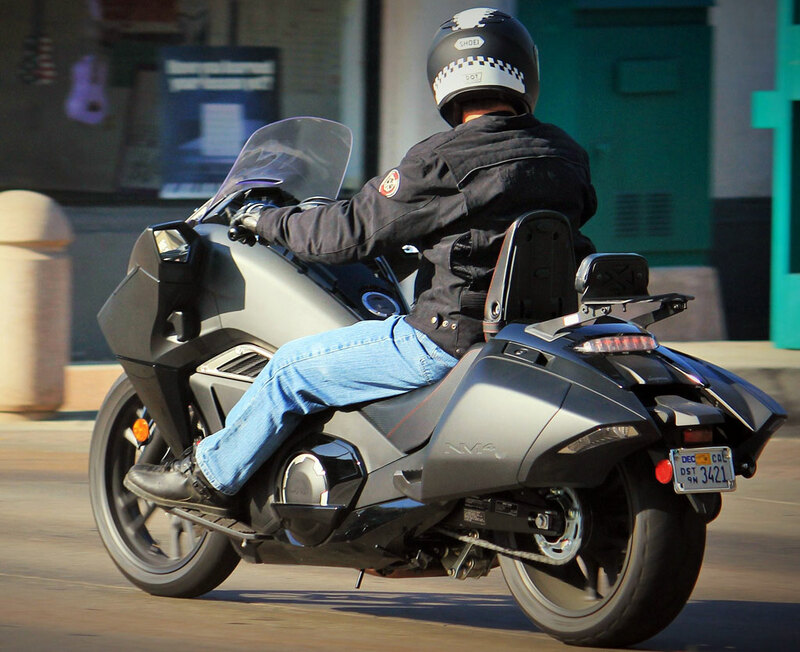 Like the other two Honda DCT 670s, you can also use your right index finger to toggle from AT to MT (Manual Trans), and use the + and – paddles on the left grip to take full control of shift points. In Drive mode, you get blue lighting, in Sport you get pink, neutral is white and manual transmission mode is red. Honda says there are 25 colors to choose from. 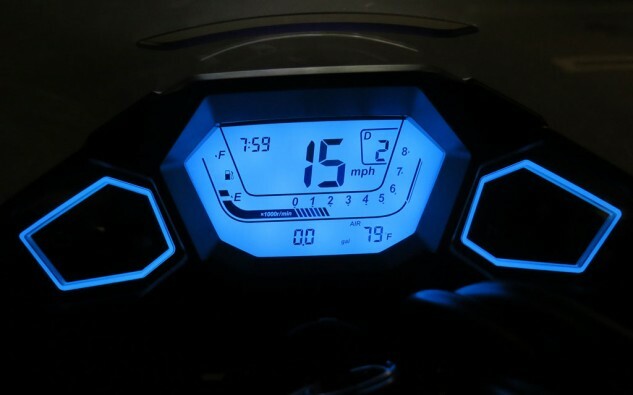 All of them give you plenty of information: bar-graph tach along the bottom, gear-position indicator and mode, pessimistic fuel gauge, air temp, trip computer, etc. The NM4 isn’t let down by its chassis: 43mm fork tubes (2mm bigger than NC or CTX) raked out at 33 degrees keep the steering super-stable at freeway speeds, but also light-steering in slow going. Eighty-five-mph freeway overpasses that have bikes like the Guzzi V7 Stone feeling a bit weavy/sketchy are completely snubbed-down on the NM4, which smothers bumps well and is not your father’s Batmobile. A right-thumb jab is all you need to switch from D to S to dial up more mid-corner speed, and you’ll be carrying seriously sporty velocity before the feelers on the floorboards and the outer edges of your shoes touch down (no flip-flops if you’re going for the gusto! ), not elbow-dragging cornering clearance, but not at all bad. An 18-inch front radial and a 200/50-17 rear combine custom looks with a modern ride and traction; 3.9 inches of well-damped travel at both ends get on with the job at hand without complaint and no bottoming with my 155-pound body. 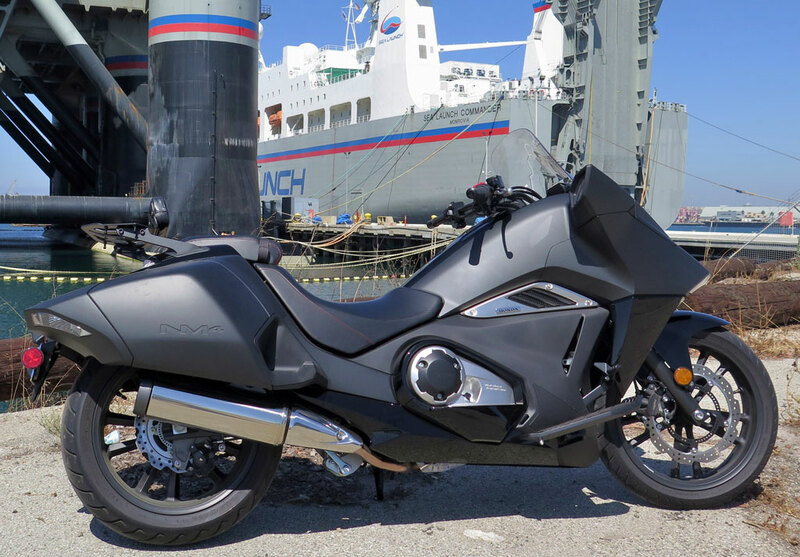 Twin engine counterbalancers, rubber-mounted footboards, well-dialled suspension: It’s all smooth, buzz-free sailing aboard the NM. Brakes are likewise unimpressive on the spec sheet, but quite capable on the road: The 320mm front disc isn’t terribly powerful, but combined with the 240mm rear, the NM4 can be made to scrub speed really quickly; both ends get ABS but are not linked. The raked-out front, long wheelbase and lowness of the thing all aid quick decel when it’s called for. I suppose my big disappointment with the NM4 is that from the moment I laid eyes on it, I assumed it was going to have serious storage capacity. Alas, opening what appear to be good-sized saddlebags rewards you with sleeved-down pockets that’ll fit about one mini-watermelon; not even Victoria’s Secret makes padded brassieres as visually misleading as the NM4’s bags. Wait, maybe the front compartments are where your stuff goes? Wrong again! The right front, to its credit, will swallow one bottle of wine, cork down, but that’s about it. The three-gallon tank doesn’t give you enough range for real space exploration. Compared to its less expensive siblings (the NC700X DCT ABS and CTX700 DCT ABS both retail for $8799), $10,999 to play dark prince seems like a lot. For that kind of cake, cruise control would be good, along with a few other items. The NM might have as much storage as the NC in total, but broken up into four little compartments, it’s not nearly as useful. The NM4 doesn’t even have a helmet lock. 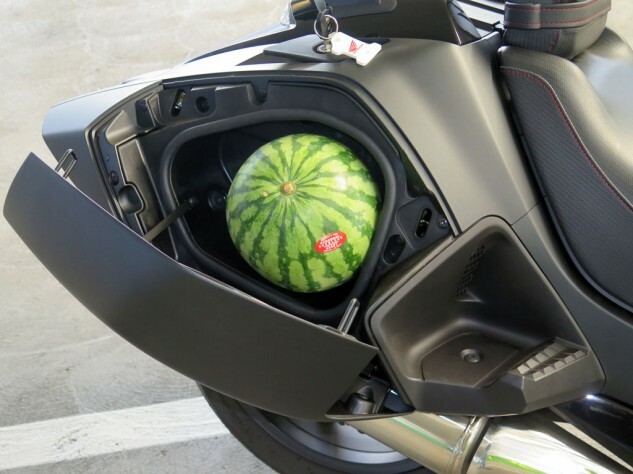 As for me, it mainly serves the same purpose as the CTX700 – to remind me how much I really like Honda’s NC700X, a bike that does everything better and cheaper, and will even hold onto your helmet for you in its big locking compartment while you pop in for a new bowling ball or goat head or box of cheap wine, which it will then conveniently transport. At the end of the day, though, the NM is like a lot of things in search of a niche: If you’re a short-legged Goth (do we have those anymore?) with a Christian Bale fixation and the price of admission, you’ll love the NM4. Just remember, capes and motorcycles don’t really mix. Our test NM4 is equipped with Optional Equipment: High Windscreen, $199.95; Rear Backrest with Rear Carrier, $449.95; Heated Grips with Attachment Kit, $139.95.